New research shows that cone snails — ocean-dwelling mollusks known for their brightly colored shells — attack their prey faster than almost any member of the animal kingdom. There are hundreds of species of these normally slow-moving hunters found in oceans across the world. They take down fish, worms and other snails using a hollow, harpoonlike tooth that acts like a spear and a hypodermic needle. When they impale their prey, cone snails inject a chemical cocktail that subdues their meal and gives them time to dine at their leisure. It’s the way they shoot the harpoons that amazes researchers. 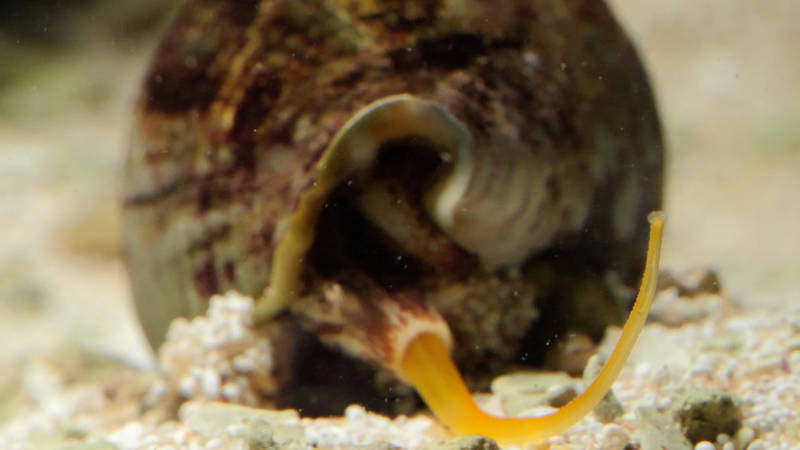 Cone snails launch their harpoons so quickly that scientists were previously unable to capture the movement on camera, making it impossible to calculate just how speedy these snails are. Now, using super-high-speed video, researchers have filmed the full flight of the harpoon for the first time. It’s not quite as simple as pointing a camera at a snail, however. 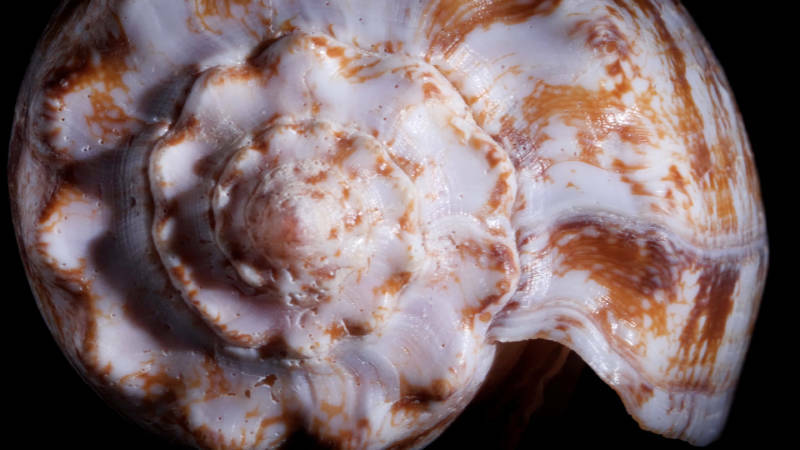 Joseph Schulz, a biologist at Occidental College in Los Angeles, studies the biomechanics of how cone snails fire their harpoons, and led the efforts to document the phenomenon. Schulz’s team used cat cones, a small, fish-hunting species of cone snail with shells about 1 to 2 inches long. Their hunting appendage — a fleshy, extendable tube called a proboscis — is translucent, like frosted glass. That allowed the scientists to view the harpoon, which rests within the proboscis, and film its movement. To record the harpoon-firing process, the researchers had to train the cone snails to extend their proboscis down a heavily illuminated trough and shoot the harpoonlike tooth into a fish-scented membrane at the far end. The lighting was so bright that the scientists had to wear sunglasses during the experiments, he added. The team started the high-speed filming using a recording speed of 8,000 frames per second. But it couldn’t match the speed of the cone snail strike. They had to bump the frame rate all the way up to 58,000 frames per second to fully capture the harpoon’s movement. By comparison, slow-motion replays in baseball and football games are usually filmed at 500 frames per second, said Toni Lucatorto, a product manager with Vision Research, the company that manufactures the high-speed camera that Schulz and his colleagues use. From start to finish, the harpoon’s flight takes less than 200 microseconds. That’s one five-thousandth of a second. It launches with an acceleration equivalent to a bullet fired from a pistol. This puts the cone snail in fine company, roughly equal to the acceleration with which trap-jaw ants snap their mandibles shut and mantis shrimp strike prey with their smashing arms. The team is finalizing measurements and calculations for an upcoming scientific publication. So how do these sedentary snails pull off such a high-octane feat? Hydrostatic pressure — the pressure from fluid — builds within the half of the snail’s proboscis closest to its body, locked behind a tight O-ring of muscle. When it comes time to strike, the muscle relaxes, and the venom-laced fluid punches into the harpoon’s bulbous base. This pressure launches the harpoon out into the snail’s unsuspecting prey. As fast as the harpoon launches, it comes to an even more abrupt stop. The base of the harpoon gets caught at the end of the proboscis so that the snail can reel in its meal. The high-speed action doesn’t stop with the harpoon. 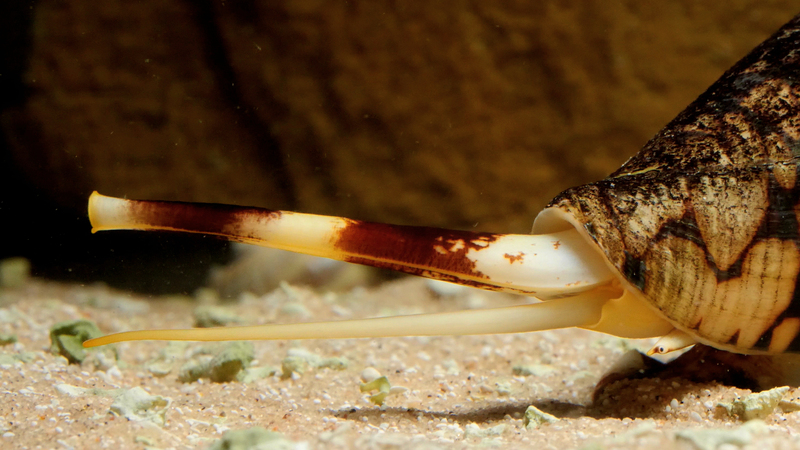 Cone snail venom acts fast, subduing fish in as little as a few seconds. The venom is filled with unique molecules, broadly referred to as conotoxins. Individual snails can produce up to 1,000 different venom components, according to Frank Marí, a biochemist with the National Institute of Standards and Technology in Charleston, South Carolina. Marí studies the chemicals produced by marine organisms, with a particular focus on cone snails and conotoxins. Many cone snails are venomous, he said, which sets them apart from other mollusks. The composition of cone snail venom varies from species to species, and even between individuals of the same species, creating a library of potential new drugs that researchers are eager to mine. In combination, these chemicals work together to rapidly paralyze a cone snail’s prey. Individually, some molecules from cone snail venom can provide non-opioid pain relief, and could potentially treat Parkinson’s disease or cancer, Marí said. “You have a huge library of potential compounds that have medicinal purposes, and we’ve barely touched the tip of the iceberg,” he said. To collect venom from the snails in his lab, Marí has trained them to fire their harpoons through a film and inject venom into a small tube. Schulz also “milks” cone snails in his lab the same way. Schulz focuses on a group of cone snail compounds called neuroexcitatory peptides. These are small molecules that activate cells in the nervous system. Understanding how they function could someday be useful in treating spinal cord injuries by getting neurons more active, he said, or treating conditions in which the muscles that move food through the digestive tract stop working properly. And, as researchers learn more about these peptides, there may be applications that they hadn’t imagined, Schulz said. “Even though cone snails have been studied for decades now, there’s still a lot to be learned,” he said.